I love cookbooks. I might even be a cookbook hoarder. 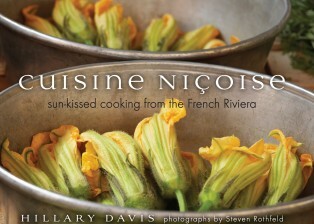 So when my Virtual Potluck pals asked if I wanted Cuisine Nicoise by Hillary Davis, of course I said yes. When people think of French cooking, they might think of fancy sauces and elaborate meals, but French cuisine can also be very simple. What's more French than a baguette, a hunk of cheese, and a bottle of wine? It's simple, yes? But of course, even the simple meals have nuance. That's not a baguette from can - it's a good baguette from a good bakery. And a good cheese. And the perfect wine. So when I browsed through the book, looking for recipes to make, I had that simplicity in mind. 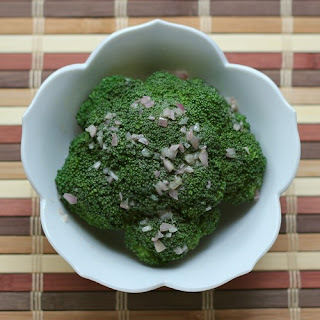 And I settled on a side dish - a bouquet of broccoli with a shallot vinaigrette. The genius in the serving of the broccoli is that you cut it into however many servings you need, then reassemble the broccoli head in a bowl so that it looks whole. Then the vinaigrette is drizzled on top. The result was simple. But elegant. And fun. And whimsical. And the purple shallot made a nice contrast to the green broccoli. This would also be an interesting way to serve a small head of cauliflower. And the vinaigrette would be lovely on a green salad or drizzled on fresh ripe tomatoes. I have to say this is really a lovely book, and I was smitten with the pastas, risotto and pizzas section. Risotto with parmesan, ricotta, and lemon sounds pretty amazing, and the Angel Hair Pasta with Friday Sauce is on my must-do list. And or course I'm curious about the French take on pizza. But for now, a simple side with a pretty presentation. Cut the stalk of the broccoli to about 2 inches long or whatever is going to make it fit right in your particular bowl. Have an ice water bath standing by. Heat a pot of salted water to a boil, then lower the head of broccoli into the water and cook for 8-10 minutes, until the stalk is tender, but the broccoli is still bright green. Remove the broccoli from the water and plunge it into the ice water. This stops the cooking and sets the color. Pat the broccoli dry and then slice the stalk so you can separate it into 4 pieces than can be reassembled in a bowl to look whole again. In a medium bowl whisk the olive oil, vinegar, lemon juice, salt, mustard and shallot until well combined. (I used the shake-in-a-jar method, but whatever works for you is fine.) Taste and adjust seasonings. I received a copy of Cuisine Nicoise from the publisher.